Take every Cryomancer's favorite D&D 4E Heroic Tier construct out for a devastating spin with guest blogger Jerry LeNeave of The Dread Gazebo. 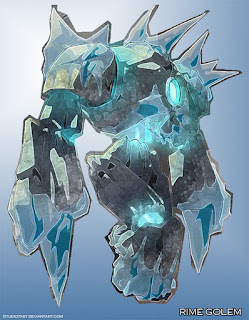 A translucent frame typically 8-10’ tall, rumbling with the force of glaciers grinding against one another, the Rime Golem is an imposing sight at the very least. Rime golems are often only found as conjurations bound to powerful Cryomancers, Warlocks and certain Necromancers. These constructs rarely occur in nature outside of the elemental planes and regions of deep frost, far beyond the reach of mortals. Rime Golems are so rare they are often sought after as prizes, being stolen and used as pawns in the personal wars and affairs of powerful arcane masters. Aside from the common duties golems are often created to carry out, Rime Golems are often spawned from the raw spite and hubris of their creator and surroundings. The precise, unrelenting demeanor these creatures exude is unrivaled by most other constructs, their sentience seeming much more calculated and sinister than the rest. 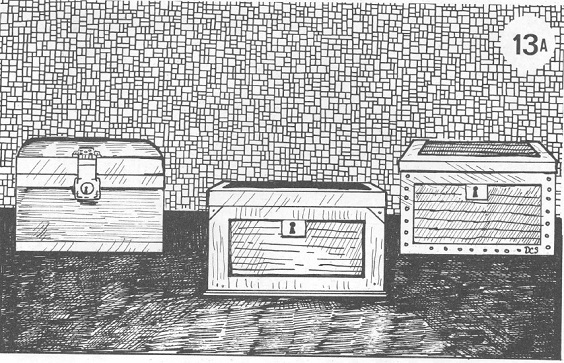 Means for creating these creatures is a well-kept secret, only known by the most powerful liches, warlocks and wizards and their disciples, often nestled into the farthest recesses of the world. One thing is widely known about their creation however, it is said that before one can create a Rime Golem, they must pass through the cold embrace of death – a harrowing trial run by the Raven Queen herself that must be completed within the confines of the Shadowfell.